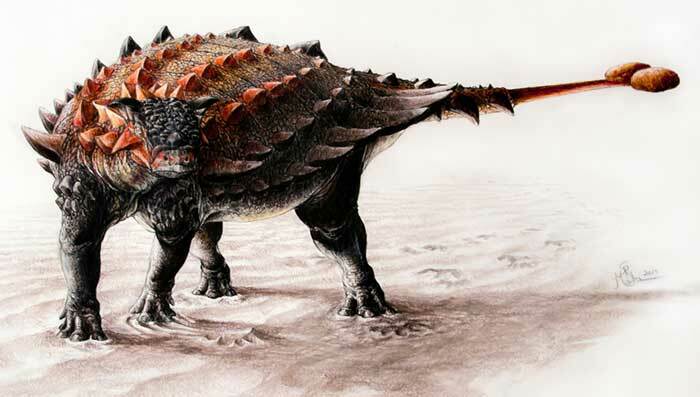 The remains of an unusual armored dinosaur found in New Mexico may “fill the gap” in the fossil record of the lumbering, plated beasts known as ankylosaurs, paleontologists say. Its distinctive horns and scales prove it to be a new species to science, and adds to the evidence that the ankylosaurs that roamed what’s now the American Southwest were related to, but clearly distinct from, their northern cousins commonly found in Montana and Alberta. “We were really excited by both its familiarity and its distinctiveness—we were pretty sure right away we were dealing with a new species that was closely related to the ankylosaurs we find in Alberta,” said Dr. Victoria Arbour of the University of Alberta, in a press statement. Arbour and her colleagues, experts in ankylosaurs, were called in to help investigate the fossil when it was first discovered in the Bisti/De-Na-Zin Wilderness of northwestern New Mexico in 2011. 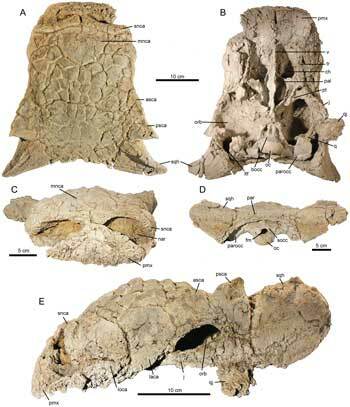 The animal’s complete, intact skull allowed scientists to identify several unique traits, including unusually tall spikes along the back of its neck, and unusually shaped scales on its face and nose. “The horns on the back of the skull are thick and curve downwards, and the snout has a mixture of flat and bumpy scales—an unusual feature for an ankylosaurid,” Arbour said. The ancient sediments where Ziapelta was found date back about 73 million years, a span of the Late Cretaceous from which, so far, no northern ankylosaurs have ever been found. “The rocks in New Mexico fill in this gap in time, and that’s where Ziapelta occurs,” Arbour said. As a result, the discovery of Ziapelta could provide crucial new information about the evolution and dispersal of the Ancient West’s armored dinosaurs. “Could Ziapelta have lived in Alberta, in the gap where we haven’t found any ankylosaur fossils yet? Arbour and her colleagues report their findings in the open-access journal, PLOS One.